New security threats are discovered on a regular basis. As new threats are found, security patches are then released in the next version of firmware (or systems software) which is about every month or so. Having these security updates provide the most up to date protection for a customer’s network! With all copier manufacturers, firmware has traditionally been updated manually at the device. This time consuming task results in many copiers and multifunction printers having outdated software and not having the latest security patches. 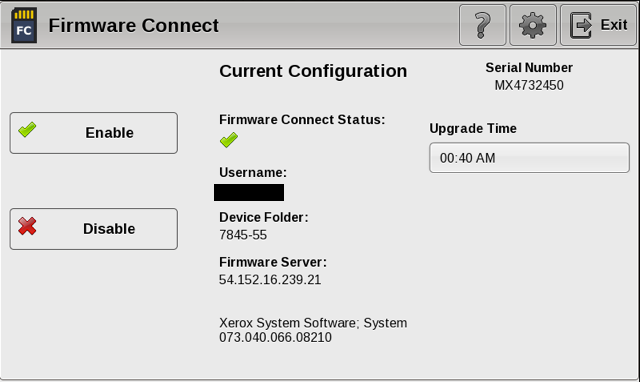 The Firmware Connect App for Xerox multifunction printers provides automatic software & security updates ensuring the customer’s network has the most up to date protection! The National Institute of Standards and Technology recognized the need for ongoing security updates in their Risk Management for Replication Devices report. Among the threats to replication devices (copiers & MFPs), the list includes outdated and/or unpatched operating systems and firmware. Contact us at anytime to discuss!